This iconic WA vessel is built for extreme conditions to comfortably accommodate her guests. It was originally built to survey as a company PR vessel and was built heavier due to the clients requirements. It was the first of this cabin design but following completion, another two vessels with a similar cabin configuration were built. The interior layout is of super-yacht proportions with a full beam master suite, forward VIP cabin and bunkhouse cabin for up to four singles. 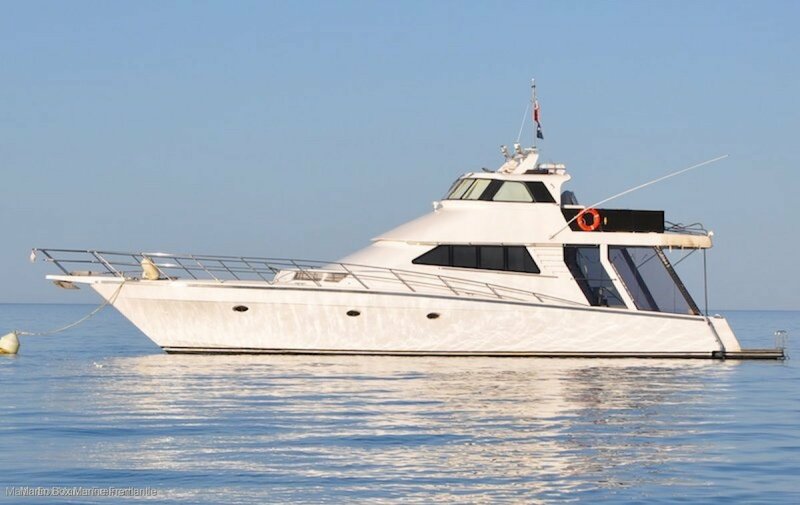 Licensed in AMSA 2C survey for 2 crew and 6 berthed passengers, "Black Label" is well suited to cruising the coast of Australia searching for the best fishing destinations. Powered by twin 12V92 Detroit's at 1100hp each, she will cruise at 15 knots making quick passages. Be it pleasure or charter use, entertaining is an easy task with ample space, a marine barbeque and Eutectic drinks fridges in the cockpit opposite a huge lounge and table. The marlin board has enough room to land a parra-sailor and a hydraulic davit can hoist tenders or jetskis on to the top level. An air conditioned enclosed bridge delivers great vision and ample electronics are all laid out at your finger tips. "Black Label" is begging for a new owner to continue loving her to ensure she provides many more years of enjoyment for whoever steps onboard. Please call Jake Flintoff on 0402 905 911 to organise an inspection. Full beam master suite with queen bed, ensuite and separate shower. Convertible saloon couch / double. Seven seperate compartments mechanical and electric operated from the bridge. A big volume charter vessel capable of comfortably handling extreme weather conditions.